End Times pastor and televangelist Perry Stone of Voice of Evangelism, Tennessee, recently claimed that world leaders, particularly in Europe, have not only abandoned their Christian background, but actively pray to Satan. 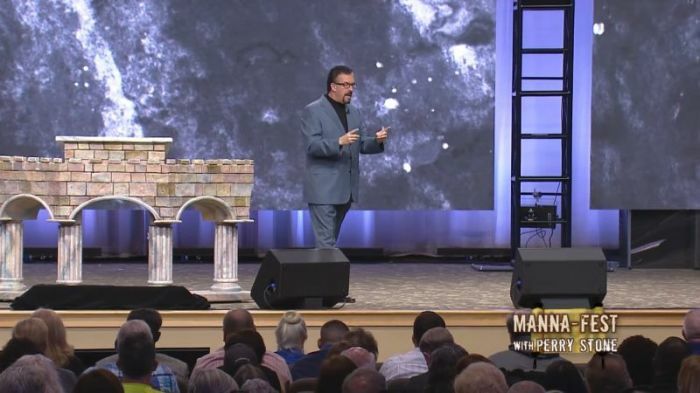 In a sermon last week on his Manna-Fest program, Stone talked about the rise of the "deep state" in Western society, which he warned is a secretive network of rich and powerful people who have a globalist vision. Stone argued that such people "unite over money, they control shipping, trade, the global banking system," adding that in some cases they also "control the leaders of the major religions around the world," without naming names. He said that this network "works in the shadows," but added that because God "never lets Satan control everything," sometimes good does come out of it. For example, because of globalism people are able to hear the Gospel in places where it is restricted or banned. Later in the sermon, Stone said that a few years ago he had a meeting with a billionaire businessman, who informed him that globalist world leaders don't view Satan as a fallen angel, but as someone who God is "jealous" of and has given a bad rap. Moreover, the unnamed billionaire shared that such politicians pray to Satan before dinner, saying things such as "[let's] rise together and pray to our father Lucifer" before eating. "He said something to me that I will never forget and this is probably going to amaze some of you," the televangelist told his congregation. "He said, 'You'd be shocked how many of the world leaders, especially in Europe, are Luciferians.'" "He said, 'These individuals are from the Catholic and Orthodox backgrounds, so they had a Christian background when they were raised, but as they got older and were educated in the universities, they had a twisted concept of Lucifer or Satan.'" Such people, the preacher added, believe that "if we associate ourselves with Satan and we give our allegiance to him, he has the power to give us the world kingdoms, to give us countries and nations, and to make a lot of money." The pastor insisted: "I know for a fact that there are people in high places who have dedicated or given themselves over to Lucifer ... If you're going to be a world leader and have an effective leadership, then you are going to have to somehow, in some way, align yourself in the allegiance of Satan." Stone, an author known for his analysis of prophecies, has linked major world events, such as the ongoing civil war in Syria, to events envisioned in the Bible. "It has been noted that in the prophecy of the war of Gog of Magog in Ezekiel 38 ... Syria is missing from the list of nations that form an (Islamic) coalition and move like a violent storm cloud over the mountains of Israel," Stone wrote back in 2012. "It just may be that the destruction of Damascus – a city that houses an estimated 10,000 terrorists and is friends with the radical government in Iran – will serve as the trigger for the predicted Islamic coalition to make its move upon Israel in the future, as retaliation for a war that occurred prior to the war of Ezekiel 38 (which tells of an invasion of Israel)."